27th January – our AGM was held with 3 positions on our committee declared vacant – all 3 position were filled by single nominations for each position and therefore no elections were held because no positions were contested – congratulations to Marie Smith – Vice President, Vicki Hamilton OAM – Secretary, Ray Whittaker – Committee member. We wish the committee all the best in 2019 and hope the year is a successful one for the organisation. 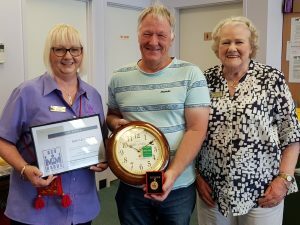 Rod Le Lievre for all his hard work and dedication to our organisation – Rod has been doing all our signage for our org for the last 18 years and has done it as a donation to us. We are very proud to have someone who has supported us in this manner – wanting to make the org always look professional. Others in our org were also thanked for their help during the year. Pictured below is Rod Le Lievre accepting his award.